Melt butter in large skillet over medium-high heat. Add bread crumbs; cook and stir until dark golden brown. Remove crumbs from skillet; set aside. Heat oil in same skillet over medium-high heat until hot. Add chicken; sprinkle with 1/4 teaspoon salt and pepper. Cook 4 to 5 minutes or until browned. Turn chicken; move to one side of skillet. Add mushrooms and garlic; cook 3 to 4 minutes or until mushrooms are tender, stirring occasionally. Reduce heat to medium-low; cover and cook 15 to 20 minutes or until chicken is fork-tender and juices run clear. Place chicken in au gratin dish or shallow serving dish; spoon mushrooms and garlic over and around chicken. Cover to keep warm. In same skillet, combine half-and-half, milk, flour, 1/8 teaspoon salt and tarragon; mix well. Cook and stir until mixture boils and thickens. Add cheese; stir until melted. Pour over chicken and mushrooms. Sprinkle with browned bread crumbs. Au gratin recipes are baked or broiled in order to brown a cheese or bread crumb topping. The bread crumb topping for this recipe is browned in a skillet, so this dish is prepared completely on the stovetop. An au gratin dish is a shallow casserole dish. The broad surface allows for more of the crumb topping. 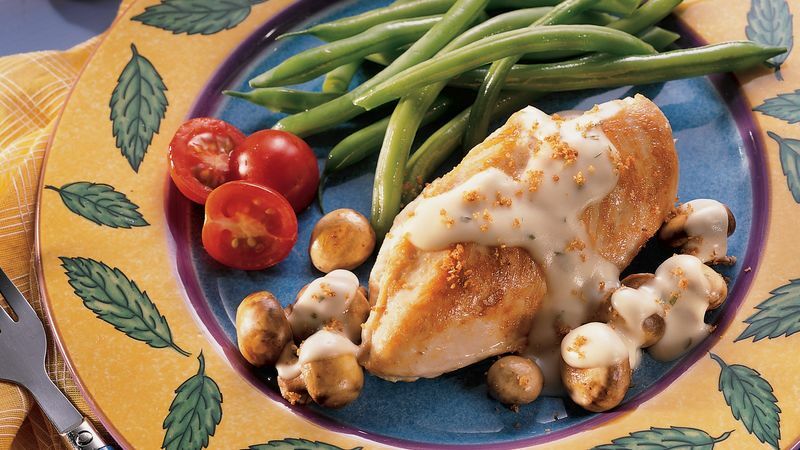 Try this rich chicken casserole with crisp breadsticks and steamed green beans.